For decades, Cuban schoolchildren were taught a slogan about the kind of pioneers of Communism they should aspire to be: “Seremos como el Che!” (We will be like Che! ), that is, like the Argentine insurgent Ernesto “Che” Guevara, who played a leading role in the 1959 Cuban revolution and later sacrificed his life in pursuit of revolution in Bolivia. In the wake of Fidel Castro’s death at age 90 on November 25, 2016, however, the school curriculum now includes songs and posters that state “Yo Soy Fidel.” Indeed, “I am Fidel” has become a new mantra of revolutionary commitment heard and seen throughout the island. History will record Fidel as the undisputed comandante of the Cuban revolution, the charismatic and grandiose former guerrilla leader who transformed a Caribbean island that had served as a playground for wealthy Americans, the mafia, and other malevolent US interests into a proud nationalist country with an outsize role on the world stage. But it is the legacy of his younger brother, Raúl, who officially steps down as president this week, that may prove to be even more compelling for Cuba’s future. Raúl Castro opened the door to many basic necessities that Cubans had been denied. Over the dozen years that Raúl led the country—he replaced his ailing brother in July 2006 and officially assumed the role of president in February 2008—Cuba has slowly evolved away from a tightly controlled, hyper-state-centric system toward a more dynamic and modern, if still fundamentally socialist and authoritarian, society. Raúl Castro opened the door to many basic necessities that Cubans had been denied—access to cell phones, the Internet, freedom to travel, the sale of private property such as homes and cars, and a functioning private sector, among other needed freedoms that affect the daily lives of many average citizens. He also achieved a historic modus vivendi with the United States—no small feat given the years of US aggression and perpetual hostility to bilateral relations. Despite Trump’s efforts to sabotage improved relations, Cuba and the United States remain connected economically, culturally, and diplomatically. 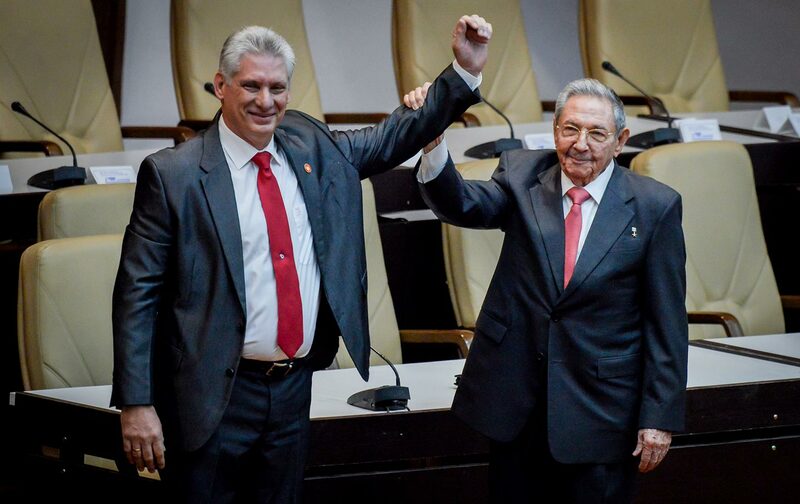 Díaz-Canel will be the first non-Castro to lead Cuba since the revolution, as well as the first non-member of the original July 26 revolutionary movement. His legitimacy, therefore, will depend on the discernible changes he can deliver to ease the struggle of daily Cuban life, end the brain-drain of highly educated Cubans who continue to exit the country in droves, and modernize the economy and society at large. During his steady rise to the pinnacle of the Cuban Communist Party, he has gained a reputation as a listener, a consensus builder, a hands-on manager, a non-elitist, and an accessible administrator. At 58, he is approximately 30 years younger than the few surviving leaders from the generation of the revolution who have governed Cuba up until this point. International observers assume he’s modern and forward-thinking because he carries a computer tablet and is often seen working on it during meetings. For Cubans, this generational change in leadership carries high expectations for a different, if not better, future, instead of the nationalist nostalgia for the heyday of Cuba’s revolutionary past that tends to dominate the propaganda of the Communist Party. Díaz-Canel faces the daunting challenge of providing both continuity and change to address competing social, economic, and ideological pressures as Cuba moves forward. To succeed, he will have to lead the country through this historic political transition toward a far more significant socioeconomic transformation. Raúl Castro often said his reforms would continue sin prisa pero sin pausa—without hurry but without pause. As the cachet of the Castro era fades into history, the country’s new leadership may well decide to pick up the pace of change.